Another Sunday. Another gathering of great ladies! Thank you Nina, Nicole and Sara for joining me at the table! Without further ado, I present to you, this Ladies’ Lunch on a gray, rainy, blistery summer Sunday afternoon. Place the water, sugar and yeast in a small bowl, and whisk to blend. Allow the mixture to sit for 10 minutes, or until the yeast is activated and foamy or bubbling. In a medium bowl, whisk together the warm milk and melted butter. In a larger bowl, mix together the flours and salt. Add the yeast mixture and milk mixture. Combine until the dough comes together. Cover the bowl with plastic wrap or a damp, lint-free, cotton towel, and let the dough rest for 20-30 minutes. Once the 20-30 minutes have passed, knead the dough until firm, elastic and smooth. Lightly oil a bowl. Scrape the dough into the tub, and lightly coat the surface of the dough with a little oil. Cover the bowl with plastic wrap or a damp, lint-free, cotton towel, and let the dough rise until doubled, 45-60 minutes. Turn the dough onto a lightly floured work surface. Press down the dough firmly to expel some of the air bubbles, but don’t knead the dough again. Press the dough into a flattened rectangular whose long sides are a couple of inches shorter than the long sides of the bread pan. Arrange the dough so a long side is parallel to the edge of your work surface. Fold up the long side opposite you into the center of the rectangle. Fold the long side nearest you into the center. Use the heel of your hand to press the two edges together. Repeat for the short sides. Press your thumbs into the crease to seal it and create tension on the outside of the dough. Pinch the final seam closed. The final shape should be the same size as the bread pan. Lightly oil the top of the dough to keep it moist. Cover the pan loosely with plastic wrap or a towel and allow the dough to rise again until its top is ½ to 1 inch above the rim of the pan., 45-60 minutes. Preheat the oven to 400 degrees F and position an oven rack in the center. 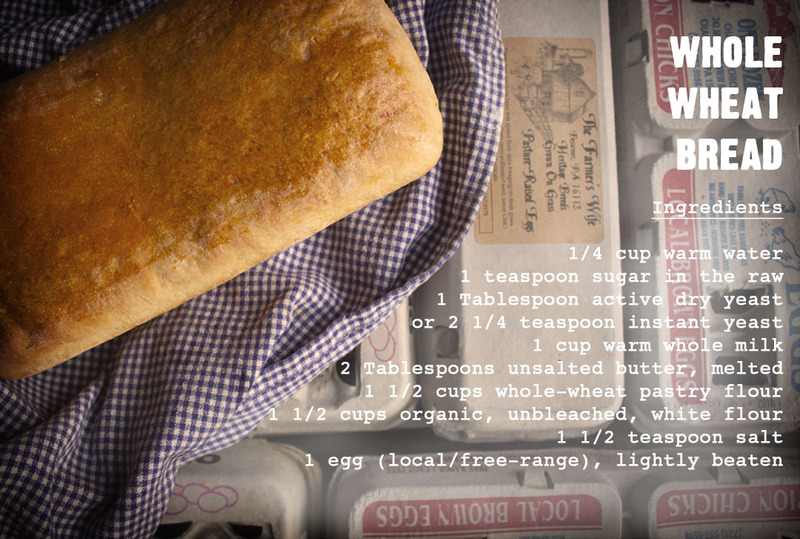 Brush the top of the loaf with a thin film of the beaten egg. Bake for 35 to 40 minutes, until the bread is golden brown and the internal temperature registers 200 degrees F.
Transfer to a wire rack and cool completely. 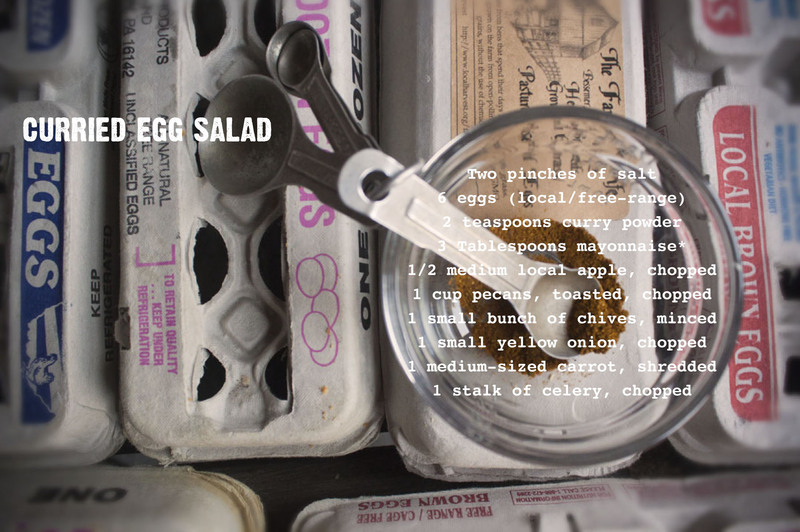 Combine egg yolk, lemon juice, vinegar, mustard, and 1/2 teaspoon salt in medium bowl. Whisk until blended and bright yellow, about 30 seconds. 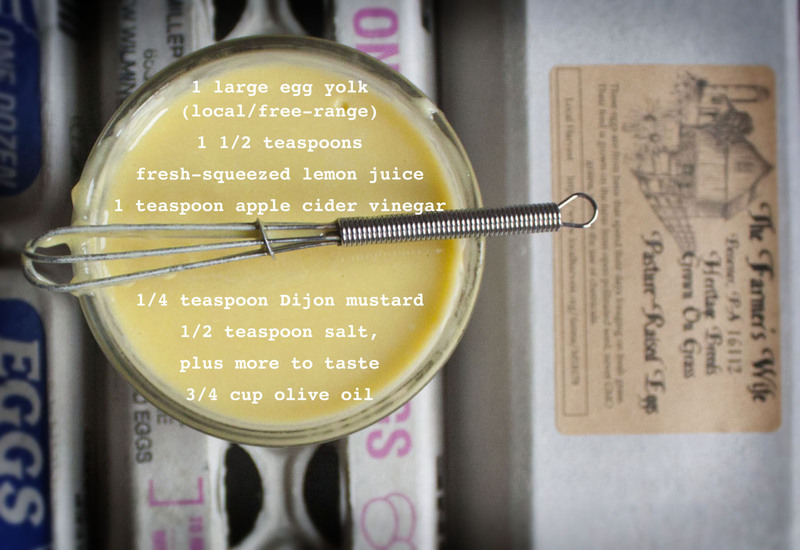 Whisking constantly, add ¼ cup olive to yolk mixutre, 1/4 teaspoon at a a time. Gradually add remaining 1/2 cup oil in a very slow, thin stream, whisking constantly, until mayonnaise is thick (mayonnaise will be lighter in color). Cover and chill. Can be made up to 2 days ahead. Keep chilled. Combine the mayonnaise (see above recipe), curry powder and salt in a tiny bowl. Set aside. In a large bowl, combine the eggs and the remaining ingredients. Add the mayonnaise mixture and stir to combine. 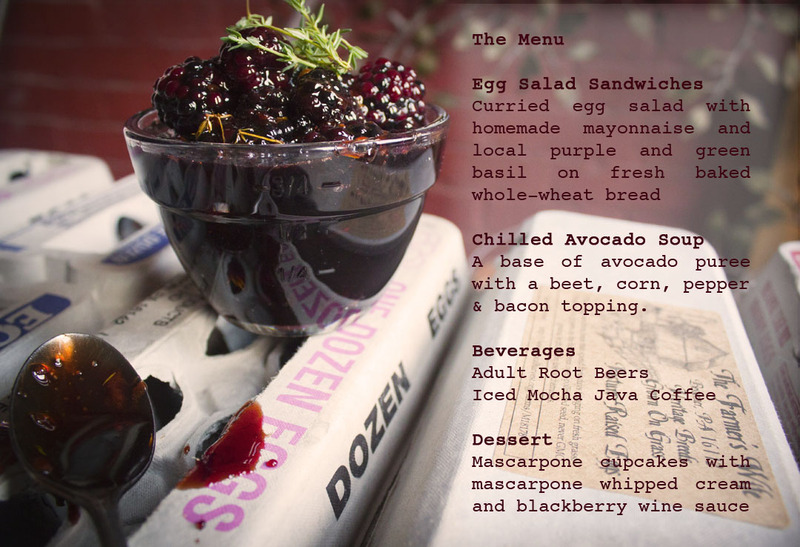 Serve with purple and green basil and the very fresh bread mentioned above. To make the soup, place avocado flesh in a blender along with chicken broth, lime juice, crème fraiche and salt. Blend until the avocados are creamy. Remove the center from your blender lid, and while blending, slowly add the water. Taste and add salt and pepper as necessary. Add the sliced avocado, and then place in a container in the fridge while preparing the topping. To make the topping, heat olive oil in a skillet over medium heat. Add onion and cook until translucent and browned, about 5 minutes. Add corn, pepper and beets and cook for 3 minutes more. Add chopped bacon. Cook until everything is warmed and just browned. 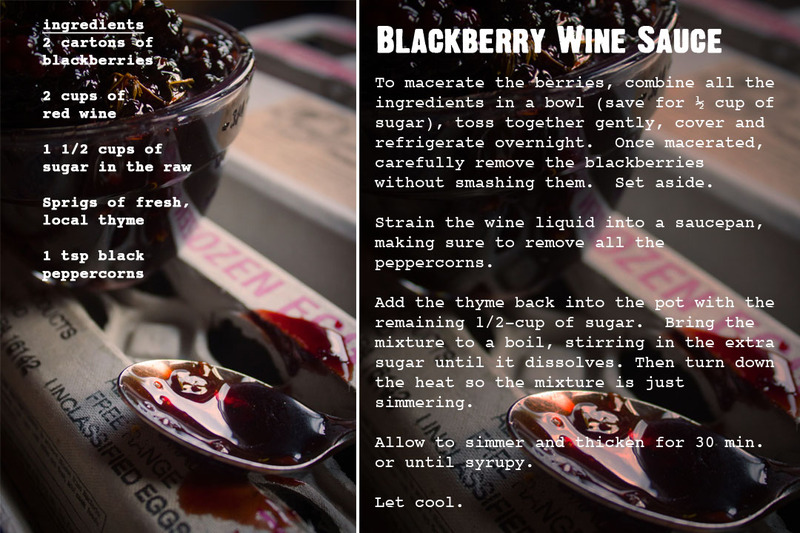 Spoon the topping into a ramekin or small bowl. Pour cold soup around the topping. Serve and enjoy. Soup lasts up to three days in and airtight container in the fridge. A hodgepodge box of jam and ball jars. 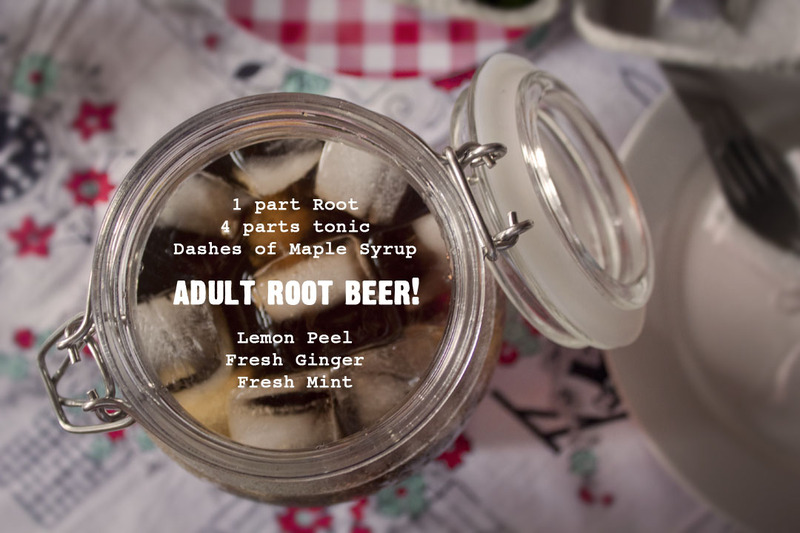 Perfect for adult root beers! Preheat the oven to 325 degrees and line a mini cupcake pan with cupcake liners. Using a hand mixer to cream the butter and sugar. Then add the mascarpone, vanilla, lemon zest and egg yolks. In a separate bowl, combine and mix the flour, baking powder and salt. Add the dry ingredients to the wet, and combine until well integrated. 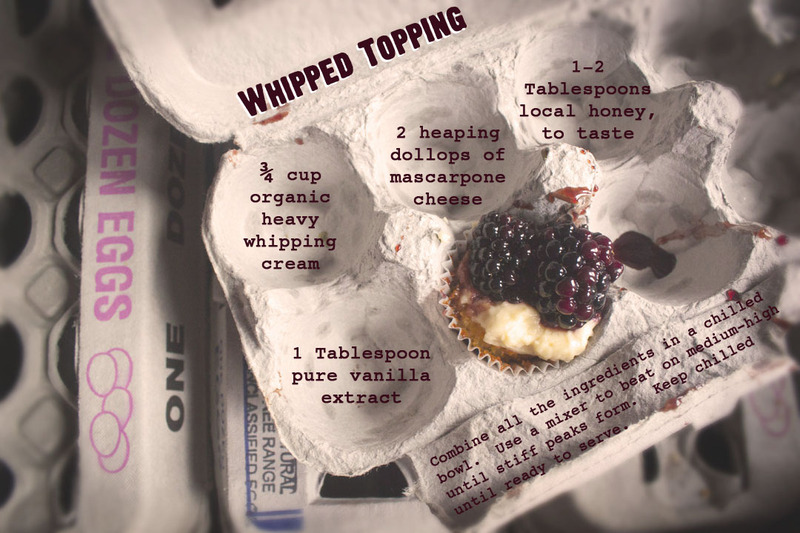 Use a spoon to put a small dollop of batter into the cupcake liners. 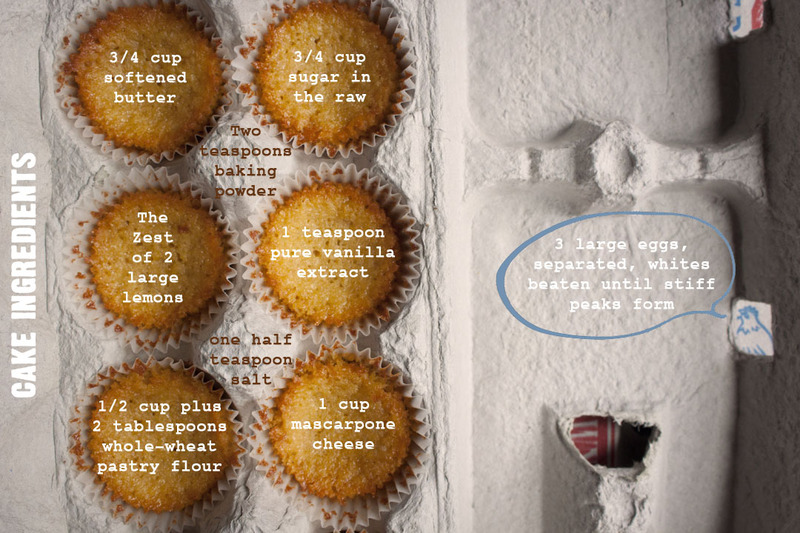 Bake for 20-25 minutes or until a toothpick comes out clean and the sides and top of the cupcakes are beginning to turn golden brown.